It’s amazing how just a brush and some black ink can be the culture of the Chinese for more than a few centuries. 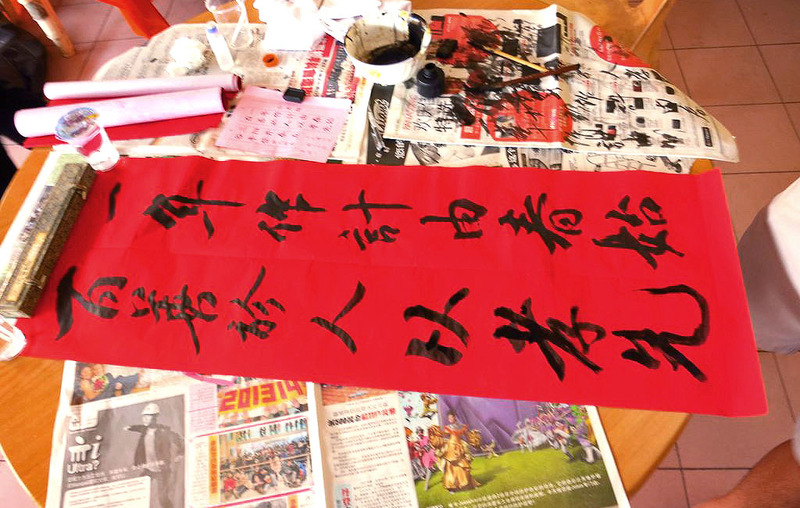 The local name for calligraphy is Shūfǎ 書法 in China, literally “the way/method/law of writing”. Chinese calligraphy history dated back to 4000 years ago. No one can tell exactly when Chinese written language appeared. The oldest script or font style discovered now is the oracle bone script (Chinese: 甲骨文; pinyin: jiǎgǔwén; literally “shell-bone script”), written on the shells of turtles. Chinese language is an ideogram system in which ideas are written into characters. Below is an example on how it evolved. This is the character of “moon”.As you can see,the picture of the moon slowly evolved into the logo/pictograph that is used today. Literally speaking, the Chinese character is a picture or an idea written in stylized form. As Chinese, we play a role in keeping our own culture alive. 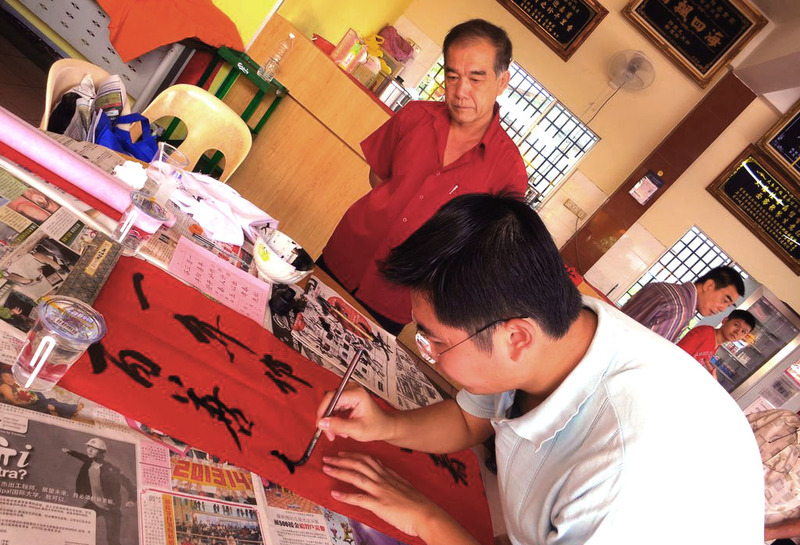 With a mix of responsibility + playfulness + challenge, we decided to join the National Chinese Calligraphy Competition organised by the Han Kang Society and Snake Year Zodiac Society. 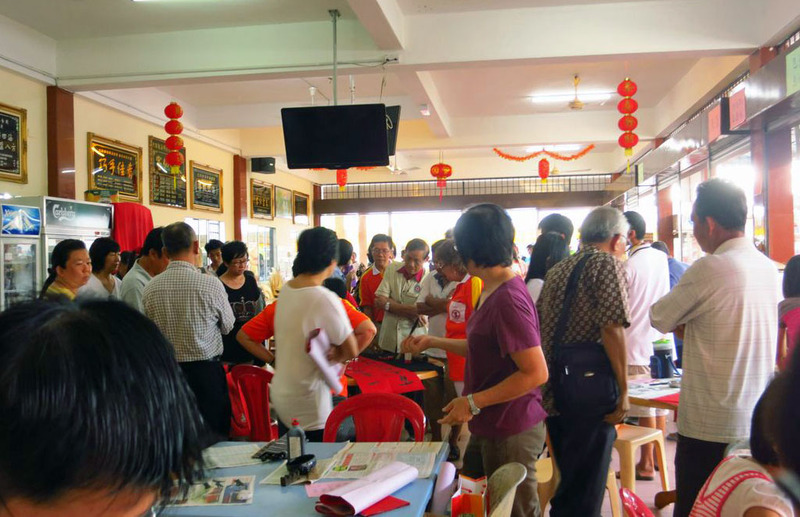 It was bright cool Sunday morning on 27th January, 2013, and we are off to a mission – Chinese Calligraphy Competition in Sg Besar, Selangor. Sg Besar is located at the upper border of Selangor state, a zone of the Sabak Bernam district. Sungai Besar(literally meaning big river) is a small port town located at the Selangor banks of Malacca Strait.Takes about 2 hours to reach from KL. A quiet town where fishing and agriculture remain as main income for majority of the townspeople. Arrived at about 930am,welcomed by hordes of fellow contestants aka fellow calligraphy enthusiasts. While waiting for the event to start, we munched on some of the ‘gao dian’ 糕点 i.e hors d’oeuvres prepared by the organizers. and a filling of stir fried glutionus rice,mushrooms,dried shrimps,spring onions,minced pork and red bean paste. with dried shrimps,fried onions and chilies. We have more than we should. After getting our special dose of traditional snacks, we started setting up the table for our calligraphy session. After a pious speech by some political figure, the contest was officiated! There was even an incessant blast of firecrackers to heat up the atmosphere. Deliberately putting my strokes on the red paper.Each stroke has to be the correct pressure,size and curve to get high points. The stanza I wrote. In simple terms,it means- the year starts with spring, human virtue starts with filial piety. The “master” showing off her skills. 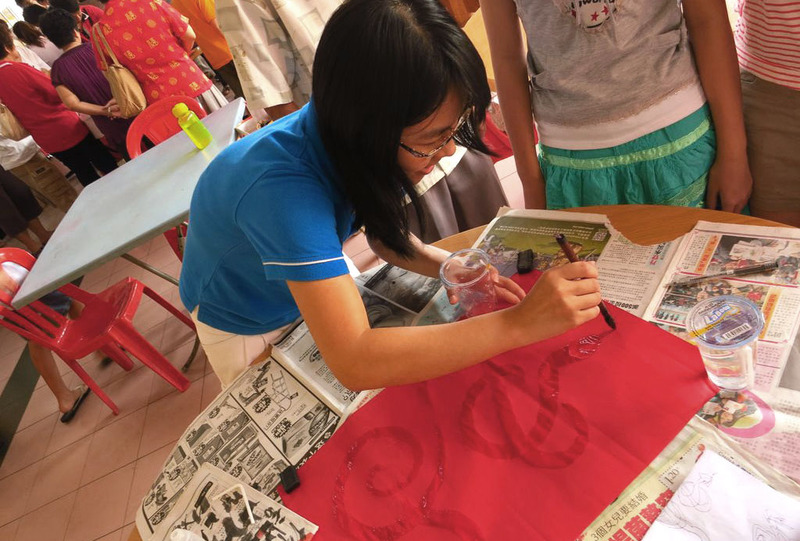 She wrote with diluted glue and then sprinkled gold dust to create a Golden Snake. Simply,creative! 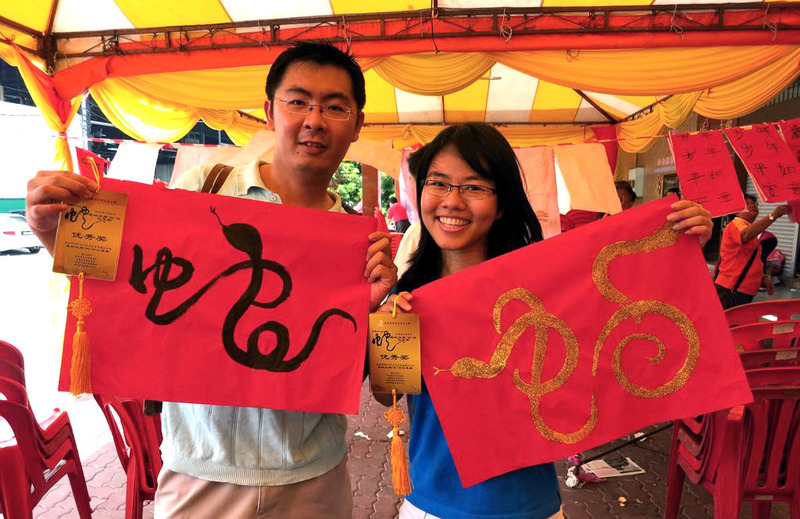 (In conjunction with year 2013 which is Year of the Golden Snake!) Huat arhhh !!! At about 1230pm,the contest ended. Suddenly the atmosphere went into a relaxing serenade. Everyone was walking around; mingling, and admiring each others artworks. People everywhere.The air exudes a sense of art and cultural enlightenment as everyone imbibes in the beauty of calligraphy. Anyway, I do believe that strategy, co-operation, genuine love and a dash of creativity was the secret ingredient behind our success. 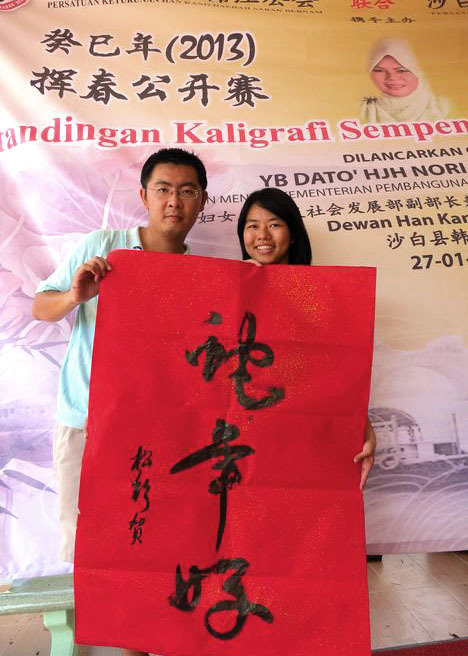 Here are some great sites about Chinese calligraphy and all its trivia. Here is the website for the Snake Zodiac Society( A NGO for those born in the year of the Snake). 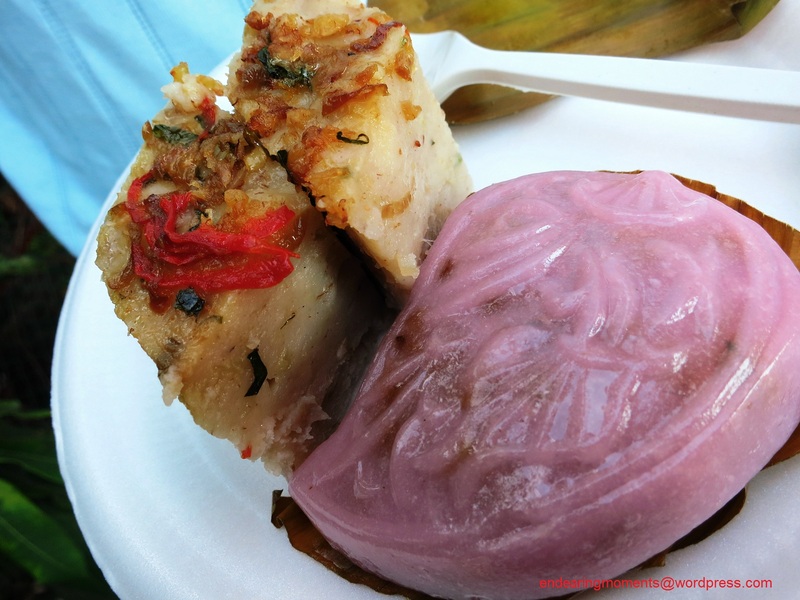 the one and only of its kind in the whole of Malaysia. They provide lots of good info about the Snake as a zodiac, its cultural importance and history. Only available in Mandarin Chinese though. It is of utmost importance to uphold our own culture and spread it to the world. Chinese calligraphy has been here for thousands of years and I’m confident it will last till the end of times. It is a beautiful form of expression that combines words and pictures. It is both, an Art and a Discipline. It is both rigid and soft. It is the epitome of Yin and Yang. We love calligraphy and we hope by reading our posts, you would too 🙂 (Do not hesitate to contact us if you wish to know more about calligraphy). All of us, regardless of age, gender, social status, i.e all walks of life play an important role in bringing happiness and positive energy to this world. We hereby send our positive energy to all our readers out there with this pic. Wishing you guys, a happy and prosperous Chinese New Year. 蛇年好 she nian hao-meaning have a good year of the snake.i.e Happy New Year ! Thank you Ivan! You like Chinese Calligraphy too?